When I was recently checking out the top five mobile phones in America (according to the Nielsen Company), all but the Samsung Intensity were smartphones. And just to make a case for Apple, the iPhone 3G was 6th on that list. Now it’s possible some of the rankings on this list has changed since then, but the fact remains that smartphones dominate the mobile marketplace. Why are they so popular? Well, on smartphones you can do things like check your email, update your Facebook and Twitter statuses, get turn-by-turn driving directions, play games, watch videos, read a newspaper and listen to music. All that and you can make a phone call. When my boyfriend and I snuggle up under the covers at night, the very last thing he does is check the news headlines on his iPhone. This is not romantic. Besides doing that, his new obsession is Words With Friends; he plays it constantly. If he can’t sleep, he’ll play Ragdoll Blaster while holding his iPhone so close to his eyes that it’s practically resting on his nose. He loves his iPhone with a passion that I can’t quite understand. As for me, I do not own a smartphone…and I don’t even want one. Is it shocking that a 30-something woman who works in the media, doesn’t want to stay “connected” through her phone? Maybe. But hear me out before you call me crazy. I am the editor of a monthly regional magazine and a yearly, statewide wedding magazine. I manage the social media for those two publications, along with a third. I teach a magazine workshop class one night a week at a local university and I am a freelance blogger. I am on the computer all the time. Most of the time I’m doing two things at once and when my phone does ring…well, it annoys me. I could literally work all hours of the weekday — but I refuse to do that. I could work every weekend, but I don’t want to do that either. I have other things to do, like paint my spare bedroom, play with my niece, knit a baby hat, make dinner, go cross country skiing and so on. In other words, I have a life outside of the world wide web. And I like that life. Sending threatening text messages to someone they don’t like. Taking inappropriate photos with the high-resolution camera and emailing them to their girlfriends or boyfriends. My boyfriends’s sister came to visit us with her kids one weekend and she spent the entire time on her smartphone. Even at the dinner table. Sure, she wasn’t working (she was texting), but what kind of example is she setting? Not only is she not teaching her children manners, but she’s telling everyone around her that they aren’t as important as what is happening on the little device she holds in her palm. It’s as appalling as it is rude. And it’s not just her — more and more people are doing it. People can’t just sit still anymore. They constantly have to be doing something. Smartphones just cater to this need for constant information, which leads to isolation. It amazes me that “unplugging” has become such a luxury. …is that something you want to have to deal with on your beach vacation? Just because you can doesn’t mean that you should. Yet if you set the expectation by being connected all the time thanks to your smartphone, you’re setting yourself up to have to react to these kinds of messages — regardless of day, time and situation. That’s why I’m happy with my dumbphone. It costs me a quarter of what it would cost for me to have a smartphone, and I can keep my life outside of the office. I can do my work during normal business hours and not feel tempted to answer that email from my client at 9 pm. I’m not able to watch a movie on the go, but that’s okay with me since I can’t really see it on a screen that small anyway. With screen size in mind, there’s no sense in reading The New York Times on your phone, either. Now the iPad…well, that’s a different story. And a whole different article. I can see your point, however one could argue that instead of emailing (or texting) about a doing the quick change and sending to corporate, they’ll just phone you and ask you to find an internet café to login on the corporate server to make the change and send it ? Therefore the problem imho is more allowing unreasonable expectations than the smartphone/tool. I think it’s a matter of balance / setting boundaries. For example, I only read work emails at the office whereas my smartphone only receives personal emails (or important services for which I want instant notification when something happens, such as a server going down). And I would be frustrated if I could no longuer bring Instapaper with me to read offline the blog posts in the train/bus that I can’t read during day time. Same with Twitter/Facebook: in order to benefit from such services, one should only add truly interesting contacts/people you really care about, otherwise the noise ratio is too high if you add just anyone. I completely agree with you. If I didn’t have a “dumbphone” I just wouldn’t be able to get stuff done and, well, just be normal. People are losing their manners and basic social skills by constantly being plugged in and isolated from the real world. There’s nothing more annoying than trying to have a conversation with somebody that is constantly checking their phone to get the latest scoop on their “social networks”. I really would like a smartphone for the maps feature, maybe I should just get a GPS. I agree with the points in the article and your points Eder to a certain extent. But it seems like what you both are talking about largely is not so much the phone, but the lack of social etiquette from people that have smartphones. I’ve also been around plenty of people with “dumbphones” that text and I find it to be equally as rude. I also think like others have proposed, it is all about balance. A smartphone can be very useful at times, but you have to be able to put it away. That is admittedly something that I struggle with at times. It is important to unplug and take a deep breath every now and again, whether you are talking about a smartphone or a computer. This is a very very intolerant, narrowminded and somehow uninformed viewpoint for a 30+ editor. All the “facts” you list up about what kids could do with their smartphones are a general problem with children getting in contact with computer and communication technology. Just think about that: Having a smartphone isn’t a commitment to being always contactable. And if you private and work life is balanced enough you won’t ever have trouble to seperate the work related mails from the private ones. Thanks for the comment, but I have to disagree with you. While it’s certainly a discipline thing when it comes to using a smartphone in a way that doesn’t impede your life, when your superiors/clients know that you have a smartphone they make the assumption that you’re available far more than you might want to be/need to be. That’s not to say that they are right, it’s just an expectation that has been put out there by the marketing of smartphones themselves. Then those who do have them proliferate the idea that smartphones make them more accessible by actually using them when they probably shouldn’t be (i.e. in bed, on vacation, etc.). It’s like how when a phone rings at dinner time. Some people get up and answer it while others don’t. A ringing phone or SMS message alert is just that: an alert. How a person responds to it is up to them and their circumstances. The same can be said for email. As for the point about children having access to smartphones, that has a lot more to do with their parents than anything else. My daughter won’t have one until I feel she’s ready for it (quite a ways off) and the same goes for Facebook access, etc. Again, I’m pretty informed when it comes to this stuff and I believe that some parents are just as enthralled with new technology as their kids — so much so that they let their kids experience that excitement when they clearly aren’t mature enough to handle it yet. This article isn’t so much about complaining about behaviour but more about showing how smartphones have impacted behaviour. I think that if people spent more time thinking about stuff while they’re not attached to their mobile devices, a lot more of them would be doing awesome work. Again, thanks for your comment — this kind of discussion is what commenting is all about, right? Sure, having a smartphone isn’t a commitment to being always contactable. Just like years ago when the clothes washer or dishwasher came on the market. Just because you HAD the new appliance that would wash your clothes and dishes it didn’t mean you’d use them all the time because it was easier than washing your clothes or dishes by hand…..
Technology has been changing the way we live for years. The smartphone is just the next technology — and it is changing our lives for the better AND for the worse — depending on how you look at it. But I don’t get the point that just having a smartphone makes you more available (for your supervisors and colleagues). In my occupational surrounding smartphones are state-of-the-art…everybody loves them for many different reasons. But behind those “thingies” there is still just a phonenumber. Nobody assumes that you answer to a work-related email within 10 minutes after dispatching it, even if that mail would be read right away by the recipient. If you want immediate replys you call. It is that simple. A smartphone is in it deepest core still a (dumb)phone. All the other uses are optional…like receiving work-related emails. It is totally up to you to choose to reply or not. I agree, the world’s people would maybe produce greater results (e.g. in science) if there wasn’t that much distraction. But it is not solely caused by smartphones. Go back in time and you will see a few great distractors, like the TV, the radio, textmessaging, magazines and even books, smoking cigarettes, walking through the whole office to get a sip of coffee. Distraction is the business world’s biggest enemy, but equally it’s biggest necessity eversince! It keeps us from working in a depressing steadily productivity increasing environment until the collapse. Some great points there. Perhaps smartphones are just the nom de rigueur when it comes to today’s distractions. Or one of many “noms”. I love my iPhones for more than already mentioned reasons; I listen to music constantly! And the idea of having to have an MP3 player AND a phone is annoying to no limit. I think what really needs to happen is that we as a society need to come up with some basic etiquette around using smartphones. This technology is so new that no one really understands ‘normal’ behavior with it yet. If we let people be rude about cell phones, we are essentially permitting their behavior. I think if each of us says (nicely) to a friend “Hey, do you mind putting your cell phone away? I want to spend some time with you.” that would help. Sure, we can’t take this approach in all situations (like with bosses) but over time, this behavior will lessen if it’s pointed out. At least I hope so! Personally I actually turn off my smartphone when I don’t want to talk to people. It drives my friends crazy but even a plugged in gal like myself needs to unplug from time to time! Great point, Nicole. We live in a culture of demand — reactivity instead of proactivity. I think with emerging technologies it’d be great if someone in the mainstream could find a way to educate others about this sort of thing. My concern is that unless it was someone that could make it entertaining and was known enough to others outside of “geekdom” (for lack of a better term), it would just get buried in the other “noise” out there. Thanks for the comment — and keep working awesome! But people from another generation see no problem with it. I don’t think I am old fashioned, but I loathe the day that these young people grow up, have their own kids, and think it’s ok to have a family meal via text message. I love read your comment, in my country we need more education about to use these new tecnologies. Every people think about they ‘need’ stay connected all the time. thanks, I read & learn. I used to feel the same way. I already was somewhat of an Internet addict, so I figured that getting a smartphone would make the situation even worse. I finally broke down and got one though (Droid X), and it hasn’t been an issue. I just don’t have the desire to sit on my phone browsing the Internet. The screen is too small for that. However, I *love* being able to search for information that is available on the Internet no matter where I go (e.g. Google Maps, etc.). The texting is far superior as well, so I can send and receive quick texts, which eliminates many phone calls. One thing I don’t do though is use my smartphone to get work e-mails. I keep my work life separate. It is important to communicate the right expectations with coworkers. I love my Droid X, and I will never go back to a dumbphone. Smartphones are just so much more convenient. While I applaud you sticking to your guns, Melanie, I doesn’t necessarily agree with your rationale for not getting a smartphone. If you don’t want one, that’s great. I’m the same way about Facebook. I don’t want one, I don’t need one, so I don’t have one. But a lot of what you’re saying isn’t really about the technology of smartphones or the access they provide; it’s about human behavior. The reality is children will always be doing something they probably shouldn’t. We didn’t have cell phones when I was a kid (it was something only rich people owned), but that didn’t mean we were any more engaged in healthy, childlike behavior that never got us in trouble. 😉 It was just less technologically inclined. I do find it funny that people feel the need to take a vacation away from their EM fields because, frankly, nothing’s stopping us from establishing that balance in our daily lives. There’s no need for a vacation. But I don’t feel that smartphones are the cause of the problem. Before there were smartphones, there were still workaholics, people who were on call to their bosses and clients every minute of the day (including vacations), and others who were addicted to distractions. Smartphones changed how we handle those situations now, but they didn’t invent them. I have a smartphone, but it’s not the source of my addiction to technology. That would be the internet as a whole. It seems to me that you could enjoy the benefits of a smartphone while maintaining the work/home separation which, apparently, people seem to struggle to find when they have a smartphone. The deciding factors are discipline and communication. First, when you go home, you can shut off notifications received on your phone. Easy. The other important element is making it clear that you work during certain hours. It takes discipline to say no to certain requests, but if you are adding value during the hours you DO work, they will respect your decision. I like my EVO and it has saved me in many situations, (thank you Google Maps), but I still REALLY enjoyed this article. I can agree with your points. Smartphones aren’t for everyone, especially kids. Excellent writing. but I think eventually people will learn to realize these terrible things. Some people just take themselves too seriously (IMHO)… I agree with you that some people have gotten out of control with smartphones, cybercafes/free wifi, etc. Just because you CAN do something doesn’t mean that you SHOULD do something. I have a smartphone and I can answer emails, log into my accounting/client portals from anywhere with an internet connection – doesn’t mean that I DO, it means that I can. Many times I have wished I didn’t have a smart phone. I have made it a cruch to use while waiting for anything, a red light, my fast food order, etc. But, I definitely draw the line at the dinner table. My teenage daughter (who has a dumb phone still) will sit there and answer texts through the whole meal. I told her to put it away or it was gone. Not at the dinner table! I have a “dumb phone” too. Like you, I don’t see the need to be available 24/7. I have business hours stated on my site. If you care to contact me outside those hours be prepared to leave a message. I do have a bad habit of sending emails after hours because it is quieter and easier to compose a thoughtful email but that’s my choice and I don’t expect anyone to reply until they get to their office in the morning. Ok, maybe if you have kids you should have your phone on and with you so if there is an emergency they (or the sitter) can get a hold of you but what happened to leaving all vital contact information with the sitter/caregiver on a piece of paper when you leave so you can have a relaxing dinner, movie or me time? Funny how the previous generations managed to function without a phone strapped to their hip. Emergencies were dealt with, other stuff just had to wait. Even when holding or attending a meeting and someone thinks answering their phone is more important than my time is annoying. We are all busy people. Time was slotted to have the meeting and accomplish something. You loose your train of thought or momentum of the conversation each time there is an interruption. The task of accomplishing the purpose of the meeting becomes drawn out because you have to backtrack then continue. Vacations are for recharging you jets. Why do you have to go somewhere where there is no internet/cellphone connection to get some quiet time? I really love your words, I use my dumpphone too, in fact, I really love it. Stay connected all the time is really crazy, I have only a one brain for think about all the thinks a wan t to do in a day. Too much noise for me. Thanks for your post. It’s really inspirating. Wow, there has been some awesome conversation on this one. I have several coworkers who have ‘dumbphones’ and, to be quite honest, they’re just has happy as someone with a smartphone. Melanie, great article here. You’re spot on: they (SPs) can be so extremely addictive that when we should be the most engaged in activities that matter (romantic, family, etc.) we often don’t because we’re glued to what other people are eating for dinner on Twitter. I wonder how much high-tech and social media burnout we are going to experience over the next few years. If you’re glued to what people are eating for dinner on Twitter, then maybe you should be a bit more selective with the people you follow ? Ha ha! Touche, Thera! Touche! Ahhh angry birds! My boyfriend’s plane got delayed last week and what did he do for an hour or so? PLAYED ANGRY BIRDS! Hahahaha! That is the crux of Twitter and Facebook’s Friendstream…you get all fragments of “news” from nearly everybody you know. I too am an advocate of the dumb-phone; mainly because of the price associated with additional services, data transfers etc. All I want out of my phone is phone calls, texting and decent battery life. As phones become more complex by including newer technologies, battery life seems to be suffering. I spend most of my day in front of a computer working in the IT industry so like some people here, I try to spend less time “connected” when I’m not working. Someone mentioned connecting to the corporate network from an Internet Cafe – I’m pretty sure this is going to be against your corporate IT policy as you should never log on from an un-trusted source. You’re putting your data and your companies at risk by doing so. As for workplaces not having expectations that you’re “always-on” when you have a smart phone – my comment to that poster is that you’re obviously not working in the IT industry! Great thought-provoking article Melanie, thanks. 1. It was merely an example of how, if they really want to bug you on your holidays, they’ll find a way, whether you have a smartphone or not; hence the problem is letting them think it’s acceptable to disturb you for futilities on your holidays, not the tool. 2. Not everyone works in a Fortune 100 company: a small IT company would just put the file temporarily on Google Docs (or an equivalent online editing tool) with a limited user for the duration of your modifications. 3. On the other hand, I agree with what you say about battery life, this is a valid downside to smartphones indeed. Great article! I also work in information technology, and between my full time job, online classes, and freelance, I am sitting in front of a computer all day long. When I get up I don’t want to be near a piece of technology. And if I am on a computer all day long, I am easily accessible during those periods of time. I was just in a meeting, and everyone in the room was scrolling through their blackberries instead of listening to the conversation, which made people have to repeat themselves. I can understand its useful during down time and traveling…but if it really was an emergency…wouldn’t we just call them? If I was in a job where I didn’t work on the web all day long, I would probably feel different. But for now, this is what works best for me. Great post! I, too, have a “dumbphone” (Motorola W755); but for me it is a cost thing; most of my phones have been free — the most expensive was $50 — so $300 for a phone is more than I am willing to pay. That, and the $30/month cost of the data plan. Not worth it for me. I have fast Internet at home and work, and the two are only four miles apart. I don’t have a busy social life, and I have a netbook for when I am on the road. So I really don’t need one. As I see it, the problem is not smartphones, the problem is bad manners — and that predates smartphones. It doesn’t matter whether you are inconsiderately talking on a dumbphone or inconsiderately updating your StalkBook… sorry, FaceBook page on a smartphone, the result is the same; instant classification as an inconsiderate idiot. As to the “can-you-do-this” request, thing, that’s an employer/employee boundaries issue; was 24/7 availability on the table when you were hired? If not, a gentle but firm “no” is in order. Doubtless you will be castigated for it, and they will try to get you to cave “just this once”, but stick to your guns. If you really love dumbphones you should check out http://johnsphones.com Designed by Dutch designers who wanted to make a simple, but beautiful phone for elderly people and kids. And now it’s taking off big time. I had a Sprint EVO 4G for about a year. I terminated the service and traded the phone in for cash, and netted just enough money to cover the termination fee and almost pay for my $20 flippy Tracfone. Yay! I like my flippy Tracfone WAY better. It has a standby time of weeks. It’s super small and doesn’t ‘pocket answer’ when I’m out walking and have to dig it out to answer it. It got so I never carried my Sprint EVO 4G smart phone with me. It INCESSANTLY dinged from work email. I couldn’t do anything, go anywhere, without it BUGGING ME about stuff that ‘might’ be an emergency. So I was paying about $83 a month to be bothered LITERALLY 24 hours a day, seven days a week. I still have all audio cues turned off for all email (and every other kind of) notifications on my computers, because all it takes now to make me INSTANTLY, SHOUTING, RANTING, PACING ANGRY is just to hear a &#@*ING EMAIL NOTIFICATION NOISE. I paid $35 for 400 minutes and six months of service on the tracfone. I’m racing to see which runs out first. It looks like I’ll have to put some more minutes into it in November. I got it in June. I mostly do VOIP calls, anyway. Work almost never calls. It’s so much more ‘convenient’ to send messages. So I blow them off until I’m at a computer, and enjoy my lunch, or dinner, or breakfast, or walk. Because they have absolutely no way short of calling me to BOTHER me. And sometimes I still leave the phone home. Because… F*** THEM. I did buy a T-Mobile ‘4G Wi Fi’ thing. It’s got some annoying quirks, but if I go on the road, I can use it with my notebook. So instead of stressing out over things I can do nothing about, I can actually boot up a ‘real’ computer and do work with a ‘real’ keyboard. The 10GB tethering plan wasn’t much more than Sprint’s ‘Unlimited’ data + 400 minute plan on that stupid ‘smart’ phone, and Sprint’s data service literally took MINUTES to load web pages. The phone would fall asleep waiting for SIMPLE web content to download. The little 4G thing is downright speedy, except it’s pretty flaky, too. It doesn’t appear to have any functional error detection, so it literally burns my bandwidth to download CORRUPT GARBAGE. Still, better than Sprint’s service by orders of magnitude. At the end of May, three months after my previous comment, I finally gave in and purchased a smartphone. This was mainly at the behest of my wife, who was presumably sick of watching me go off to work with three devices (iPod, Palm T3 PDA and DumbPhone) strapped to my belt. I ended up purchasing a Droid X2, which, thanks to a couple of discounts, I picked up for $99. My main objection to a smartphone was the $30/month data plan. My wife said “If anyone can get their moneys-worth out of the plan, you can”. She was right; it is well worth the $1/day it costs for data – and I am grandfathered into Verizon’s now-deprecated unlimited data plan. Yay. One hundred days later, I love my smartphone. It has replaced my PDA. It has replaced my GPS – and them some (Google Maps never needs overpriced “updates” – eat dirt, Garmin! ), and provided so many new features. It can even replace my iPod, with wireless syncing. I can even watch Netflix on it. Games and apps are usually only a few dollars each. I can live without it, but it makes things so much easier. A few short months ago I laughed at smartphone users. Now I am a convert. I don’t have the problems that Melanie complained about; my phone usage has not changed appreciably. What has changed is that I now have access to information anywhere. In spite of my “switching sides”, I maintain what I said earlier; this is not a technology problem, it is a people/manners problem. For anyone who might be interested, I have chronicled some of my adventures in AndroidLand on my blog. I used to be like this too. I didn’t get my first cell phone until I was 21. Up until then, I wasn’t interested in owning one, mostly because I’m not a big talker. 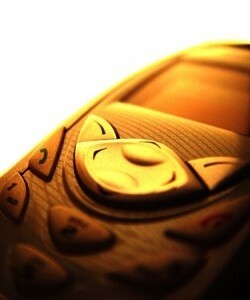 My first phone was a basic Nokia bar; I didn’t care for ”fancy” features like the camera & picture messaging. Now I own a smartphone, & I don’t think I’d trade it for another dumbphone. I admit I use my phone mostly for Internet & listening to music instead of making calls. I love my Dumbphone because easy to use and no regret if i lost it. i can’t stand the people who use their smart phone at the dinner table / restruant. Ugg!